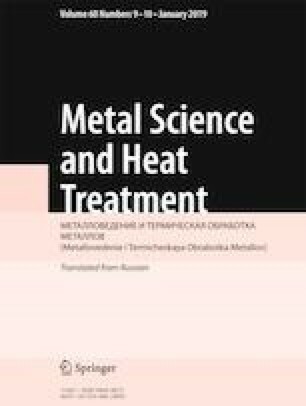 Special features of structure formation in steel 40Kh2N2MA are studied after a high-temperature thermomechanical treatment with martensitic-bainitic transformation of austenite. It is shown that the treatment produces a mixed structure represented by alternating extended regions of tempered martensite and lower bainite. The treatment raises substantially the impact toughness and the crack resistance of the steel. The process is the most effective for hardening alloy steels with enhanced stability of supercooled austenite. Translated from Metallovedenie i Termicheskaya Obrabotka Metallov, No. 10, pp. 51 – 59, October, 2018.